Highlights of 2014 foretell new trends for the hotel waterpark resort industry: Royal Caribbean’s Navigator of the Seas cruise ship is a floating hotel with 1843 staterooms and a surf simulator. Now, it has added amusements, adventure, sporting facilities and virtual reality ocean views for interior staterooms. Royal Caribbean’s new Quantum-class cruise ships go beyond waterparks to become a floating theme park with 2,090 staterooms — adding indoor skydiving, bumper cars, a circus school, roller skating, rock-climbing walls, video arcades, billiards, live music hall with DJs, performance theater and the new North Star, a glass capsule that rises 300 feet in the air giving guests a 360-degree view. Schlitterbahn South Padre Island is an outdoor waterpark that purchased the hurricane-damaged hotel indoor waterpark next door and transformed the two properties into one 65-acre Schlitterbahn Beach Resort. Jeff Henry opened the world’s tallest waterslide at Schlitterbahn Kansas City. Great Wolf Resorts completed its first conversion of an existing property in Fitchburg MA — signaling a faster way to grown the chain in new locations. Mt Olympus Waterpark in Wisconsin Dells doubled in size to 130,000 sf. Royal Caribbean’s Navigator of the Seas spent the month of January 2014 undergoing renovations. Of 1,843 staterooms, 1000 are ocean view and 643 are interior rooms, 81 of which were converted to “virtual reality” staterooms using real time balcony views of the ocean. The ship regularly departs from Galveston TX and features a FlowRider surf simulator and 3 pools as part of its waterpark. Additional features include a full-size basketball court, rock climbing wall, mini golf, golf simulator, ice skating rink, jogging trail, video arcade and a new Mexican specialty restaurant. Renovations on Navigator of the Seas were just a prelude to the floating theme park concept that Royal Caribbean had planned for its Quantum-class ships later in the year. In February 2014, Wilderness Waterpark Resort in Lake Delton WI opened a 4,000 sf indoor laser tag arena for up to 30 players. The resort also added a 2-story, 525 ft long indoor Go-Kart Trail that can accommodate 12 electric cars. Other improvements include a swim-up bar for 88 guests, a yogurt shop, libations bar and pizza kitchen. Wilderness is one of the largest waterpark resorts in the USA with a sister property in Sevierville TN owned by Pete and Pat Helland. For more, call 865-429-0625 or go to www.wildernessatthesmokies.com. Jellystone RV Park, with its full-service cabins and hookups in Bloomington IN, opened a 30,000 sf outdoor waterpark called the Water Zone in April 2014. Water Zone was designed by Wizard Works of Albany NY. For more, call park general manager Rick Walker at 812-824-3322 or go to www.lakemonroejellystone.com. The 250-room Legoland Hotel in Carlsbad CA spent about $12 million adding a 13,000 sf Lion Temple Wave Pool and expanding its outdoor waterpark by three acres, according to Legoland spokesperson Julie Estrada. For more, go to www.legoland.com. Six Flags Theme Park in Georgia completed construction on a 7-acre outdoor waterpark called Hurricane Harbor in May 2014, the largest expansion in The Park’s 46 year history. The OWP features an 800,000-gallon wave pool with waves up to 4 feet high, a dual slide that drops riders down 5-stories and whirls them around a 40 foot wide bowl. Admission to the waterpark is free with a theme park general admission. Adding the outdoor waterpark will increase the length of stay inside the theme park thereby increasing revenues. Having hotels nearby will help extend visitation from 1-day to 2-days. Nearest hotel is the 101-room Wingate by Wyndham, less than a 300 yard walk to the Six Flags main gate. For more, go to www.sixflags.com. In May, Great Wolf Lodge opened it doors in Fitchburg MA where it expanded and renovated the former Holiday Inn Coco Key Resort to the Tune of $59 million. The lodge boasts 406 newly renovated suites, 12,000 sf of conference space and a 68,000 sf indoor waterpark. The waterpark features a 6-story funnel slide, a wave pool, lazy river, tree house with tipping bucket, 30-foot high ropes course, mini golf, bowling and amusement rides. An estimated 100,000 people will visit the lodge annually. This is the first Great Wolf conversion and the first construction project since 2009. Apollo Global Management, a private equity firm, bought the Madison WI-based Great Wolf Resorts in 2012 for $798 million. For more, talk to general manager Phil Cunningham in Fitchburg or contact Great Wolf Resorts ceo Kim Schaefer at the corporate offices. Website is www.greatwolf.com. Darien Lake Waterpark near Buffalo NY added 15 new cabins, 40 RV sites, a new lodge, general store and deli in May 2014. Darien Lake already had a 7,000-person capacity with 57 cabins, 160 hotel rooms and 650 campsites. Adding lodging is a great way for park owners to attract visitors for longer periods of time. For more, call 586-599-4641 or go to www.darienlake.com. Maui Sands Resort in Sandusky OH opened 204 additional rooms in May 2014, according to assistant GM Jeff Phillips. The hotel reopened under different ownership in 2012 after being closed and unfinished for several years. The 45,000 sf indoor waterpark features two 35-mph slides, a tube slide, bowl slide, water walk crossing, activity pool and a lazy river. About 350,000 persons visit the indoor waterpark annually. For more, go to www.mauisandsresort.com. Jeff Henry and family opened its 26-acre outdoor waterpark Schlitterbahn South Padre Island TX back in 2001. Hurricane Dolly hit the area in 2008 and left quite a bit of damage. Henry bought the out-of-commission former Holiday Inn Sunspree Resort next door and decided to transform the two properties into a new 65-acre Schlitterbahn Beach Resort. The remade outdoor waterpark, which connects to the hotel, covers over 2.8 million sf and features a Tidal Wave River, a Boogie Bahn surfing ride and fast ride called Shoot the Chute. The 221-room renovated hotel includes an 80,000 sf indoor waterpark. Lodging on site extends the length of stay and total spend by vacationers. Schlitterbahn is part of a $552 million master plan for the island. Investors include Willard Hammonds, developer Paul Schexnailder, Jeff Henry and family. Financial partners include American National Insurance Company and local government. For more, call 830-625-2351 or go to www.schlitterbahn.com. 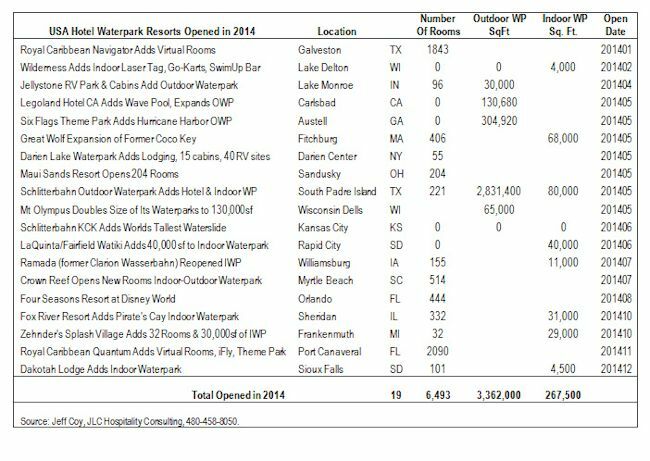 In 2014, Nick Laskaris, owner of the Mt Olympus Water & Theme Park in Wisconsin Dells WI doubled the size of his waterparks from 65,000 sf to 130,000 sf. Over the last several years Laskaris purchased many attractions and hotels totaling 1,300 rooms, which he has brought together under the Mt Olympus umbrella. Guests staying at any one of his dozen properties have free access to his theme park, indoor waterpark and outdoor waterpark. His huge OWP includes two wave pools, a couple of family raft rides, two speed slides, a mat racing slide and bumper boats. Day passes for non-hotel guests are available. If you want to talk to Nick, call 608-253-8445 or go to www.mtolympuspark.com. While the Schlitterbahn Waterpark in Kansas City doesn’t have a hotel on site, it has a strategic partner with the Kansas City Airport Marriott that offers a Family Fun package with hotel room and park admission tickets. But there’s another reason we have included the outdoor waterpark in our report; in May 2014 the owners opened the most anticipated new water ride in the amusement industry. It is called Verruckt — which means insane in German. It is the tallest waterslide in the world — taller than Brazil’s 134.5 ft Insano, taller than the Statue of Liberty, taller than Niagara Falls. Riders strapped themselves into a 4-person raft and drop from 17-stories (168 feet, 7 inches) at speeds of 65 mph with a multi-story uphill “water coaster” blast after the initial plunge. The length of the ride is 602 feet. First riders said it was like dropping out of the sky. Verruckt is the creation of Jeff Henry, Schlitterbahn co-owner and inventor of uphill water coasters. It has been certified as the world’s tallest by Guinness World Records. For more, call 913-312-3110 or go to www.schlitterbahn.com/kansas-city. The 30,000 sf Watiki Indoor Waterpark in Rapid City SD opened in 2006. Owner Dave Hama connected two hotels, LaQuinta & Fairfield, totaling 255 rooms. Watiki featured a super bowl slide, tipping bucket, lazy river, whirlpool tubs and a jungle gym. But that was not enough! In June 2014, Dave added another 40,000 sf to his indoor waterpark — totaling 70,000 sf. His expansion includes a children’s pool, an indoor-outdoor pool and a zipline. Watiki is now the best hotel waterpark resort in a 4-state region. Families can rent a Reef Suite for the closest access to the waterpark. Room and waterpark rates are usually combined in packages, but Watiki charges a separate winter admission rate of $8 weekdays and $12.50 weekends. If you want to talk to Dave Hama of HSIS Hospitality, call 866-928-4543 or call The Park at 877-545-2897. Website is www.watikiwaterpark.com. The former Clarion Inn & Wasserbahn Waterpark in Williamsburg IA closed in 2012 due to water quality. But new owners, Yule and Sae Park, reopened it in July 2014 as a Ramada Inn with 155 rooms. Working with Water Technology Inc, the new owners made 42 improvements, installed a state of the art UV sanitation system and became certified pool operators to make the water safe enough for their 3-year old daughter. The waterpark has two 4-story waterslides. Hotel room rates include 5 waterpark passes. Talk to Yule and Sae Park by calling 319-668-1175 or go to www.wasserbahnwaterpark.com. Crown Reef Resort in Myrtle Beach SC opened an indoor-outdoor waterpark for its guests in July 2014. The 20-year-old, 514-room resort installed two enclosed 38-foot waterslides from ProSlide: a dual 278-foot slide and a single 302-foot slide plus an 8-foot tall by 20-foot long Kiddie slide. The $7.5 million renovation includes 13,000 sf of meeting space, a fitness center, casual restaurant, coffee bar, ice cream shop and video game arcade. For more, call 843-626-8077 or go to www.crownreef.com. The $360 million deal to build a Four Seasons Resort on Walt Disney World property in Orlando opened in June 2014 with 444 rooms and a waterpark. Water features include a 5-acre Explorer Island family playground, 2 waterslides, lazy river, splash pad, climbing wall and free Kid’s Club. The Royal Suite expands to include 9 bedrooms to accommodate multi-generational families. Apparently, Toronto-based Four Seasons holds a 30% stake in the project with the remaining equity spit between Silverstein Properties and Dune Real Estate Partners, both of New York. Grupo Financier Inbursa, a Mexico City-based bank, provided $190 million in debt financing, according to the Orlando Sentinel. For more, contact Scott Woroch, Four Seasons’ executive vp, at 416-449-1750. Contact the hotel at 800-267-3046 or go to www.fourseasons.com. Silverleaf Resorts Inc completed construction October 2014 on its $10 million, 31,000 sf indoor waterpark at its 332-unit Fox River Resort in Sheridan IL — one hour from Chicago and within easy reach of Starved Rock State Park. Called Pirate’s Cay, the indoor waterpark features a lazy river, tipping bucket, tube rides and slides. The 10,000 sf entry building contains food service, game arcade, gift shop and large changing room with over 100 lockers. Resort members have access to two swimming pools, executive golf, mini golf, tennis, softball and horseback riding, according to Silverleaf ceo Tom Morris. For more, call Fox River Resort at 815-496-2369. Go to www.foxriveresort.com or www.piratescay.com. Al Zehnder of Frankenmuth MI opened his 156-room Splash Village Hotel & 20,000 sf indoor waterpark to thousands of tourists back in 2005. Soon he realized he needed more rooms and a bigger waterpark. After four years of planning and one year of construction, Al opened 32 new hotel rooms and a new 29,000 sf indoor waterpark in October 2014. The new waterpark features a retractable roof, manufactured and installed by Open Aire of Toronto, which makes the space useable year round. The atrium structure covers two 6-story thrill rides: a family raft slide and a super loop body slide plus a zero-entry activity pool, water geysers, water basketball, volleyball, an action river and a 20-person hot tub. Total improvements cost $20 million. The Michigan Strategic Fund approved $500,000 in block grants for the city to make infrastructure improvements, and the Michigan Economic Development Corp provided $5 million in loan enhancement funds. For more, dial 800-863-7999 or go to www.splashvillage.com or www.zehnders.com. Royal Caribbean’s Quantum of the Seas surpassed expectations November 2014 on its maiden voyage by becoming a floating theme park. More than just offering an on-board waterpark, the new Quantum departs Port Canaveral FL with a list of thrills including RipCord by iFly, the first skydiving experience at sea, and North Star, a glass capsule that gently rises 300 ft in the air, giving guests a spectacular 360-degree view. Additional thrills include a surf simulator, bumper cars, a circus school with flying trapeze, roller skating, rock climbing walls, video arcade, billiards, live music hall with DJs and a state of the art performance theater. The Quantum features 2090 staterooms including 375 “virtual reality” staterooms using real time balcony views of the ocean and 16 family-connected staterooms that accommodate multi-generational families or groups. Two more Quantum-class ships are on order for delivery in 2015 and 2016. For more, call 866-562-7625 or go to www.royalcaribbean.com. Randy and Julie Huber bought the former Brimark Inn in Sioux Falls SD in 2012, renamed it the Dakotah Lodge, spent $2.5 million on renovations and launched a 4,500 sf indoor waterpark in December 2014. The waterpark features a 167 ft long waterslide. Other improvements include a new lobby, exercise room, breakfast room and upgrades to guest rooms and bathrooms. For more, call 605-332-2000 or go to www.dakotahlodge.com. The Breaker Bay Waterpark at the Blue Harbor Resort in Sheboygan WI added a double surf simulator called the Riptide in December 2014 at a cost of $1.7 million. David Sanderson, vp and general manager, explained: “It’s a great waterpark that has always been geared to younger kids. Now those kids are teens and we want to keep them coming back.” Neuman Pools Inc of Beaver Dam WI did the work — the same company that helped to build the resort. Mt Olympus in Wisconsin Dells WI opened its new tower ride called the Manticore. It is a vertical swing offering spectacular views of the whole park. Standing 140 feet high, it has 12 arms with 12 double seats that can accommodate 24 guests at one time — a high capacity ride in a small footprint. In January 2014, Adventure Bay Indoor Waterpark opened with 40,000 sf in Windsor, Ontario. In July, the World Waterpark in the West Edmonton Mall, Alberta, added a Giant Hurricane. In Montreal, Quebec, the ALT Hotel & Oasis opened a 25,000 sf indoor surf park in December 2014. Claude Coundry is the surf park owner and American Wave Machine is the manufacturer and installer. In Punta Cana, Dominican Republic, the Memories Splash Resort opened in March 2014 with 525 rooms and a 20,000 sf outdoor waterpark. Stay positive, work smart and do the right thing!